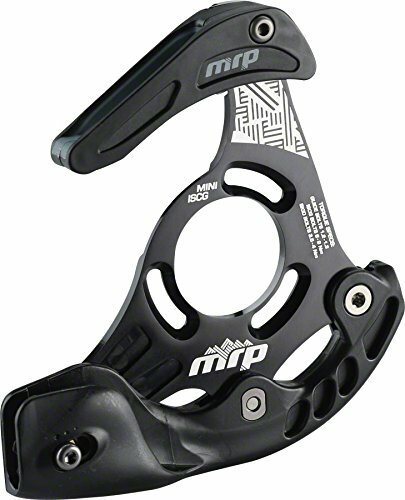 MRP Mega G4 Alloy Chain Guide 32-36T ISGC, Black by MRP at Joes V Cycle. MPN: CHMRG4MIK. Hurry! Limited time offer. Offer valid only while supplies last. The G4 features a quiet co-molded upper and adjustable lower pulley with an optional slider block for reliable retention in rough conditions. The G4 features a quiet co-molded upper and adjustable lower pulley with an optional slider block for reliable retention in rough conditions. Installs and adjusts with a single 4mm hex. Compatible with 1x7, 1x9, 1x10, and 1x11 drivetrains. Integrated nylon skid glides over rocks. Includes standard pulley and G-slide slider block for dependable operation in muddy conditions. Tracked and grooved upper guide and backplate increases stiffness. Compatible with chainlines 50mm and wider (55mm and wider on 83mm BB shells). Compatible with 32-36 tooth chainrings. Color: Black. Chainguide Mount Type: ISCG.